The term ‘artificial grass’ might still strike fear into many people. In the past, fake grass was a horrible lurid green and looked as far from the real thing as it possibly could. However, manufacturers have come up with some beautiful products over the past few years, and you can now buy a variety of artificial grasses that look real even close up. Along with the perceived fake look, many people also assume it’s really expensive too. And, though there are some costly premium products, a low-cost grass which still looks real may be more within budget than you think! The past has given a bad reputation to Astroturf, and modern fake lawn is much more than the luminous plastic grass you might have seen at your local greengrocers. Though still made of plastic, products are interwoven with various colours to make them more lifelike. They also come in various heights and are softer than their predecessors. There are also many advantages – and some disadvantages too – of buying artificial grass. 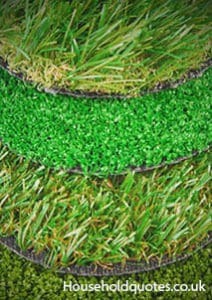 One reason many people get fake grass is because it’s easy to maintain. Simply sweep from time to time to remove leaves and twigs – you can even use a hoover! When it’s muddy, just wash out the grime with a light spray of the hosepipe and a brush. And, if you’ve got pets, just pick up after they’ve gone to the loo and disinfect the area; yes, no more yellow patches all over your lawn. One of the best things about installing a fake lawn is that you can do it yourself to save money. Artificial grass costs vary depending on the product you choose, but you can greatly reduce the overall expense if you install it yourself. A budget grass costs about £10 per square metre, though these products normally look extremely fake and are best left to shop windows. If you want something a little more realistic, then be prepared to pay in the region of £22 per square metre. With this middle price range, it’s extremely important to get samples because though some are lifelike, others are obviously artificial. Finally, the most premium grass is more aligned with the cost of carpet and can cost £27 per square metre or more. However, they’re extremely durable and many manufacturers will give a guarantee they’ll last at least 15 years. Overall, it means that if you’re covering an area of 50m², the cost of artificial grass will be between £500 and £1,350 – not bad for a lawn you’ll never have to mow. If you’re worried about spending a lot on your fake lawn and mucking up the installation process, it’s best to get a skilled professional in. You can use a trusted site, such as Quotatis, to gather quotes for various firms. On average, costs will vary between £60 and £75 per square metre for installation. Therefore, if you’re covering an area 50m², it means the cost for grass and installation will be between £3,500 and £5,100. There are various other factors that can affect costs too. For example, unusual shapes and lawns with curves cost more because of expensive off-cuts, whilst quotes for small gardens are often expensive. However, if your lawn is more than 50m², you can often see installation costs dropping to around £50 per square metre. Though many other projects offer the chance to do some groundwork as a way to reduce installation costs, scraping off the pre-existing turf is unlikely to affect your quotes. This is because it doesn’t take installers very long to cut out existing turf; most of the skill is in building the wooden frame, levelling out the kiln-dried sand, rolling out the artificial grass and then sealing the edges together to avoid unsightly joins. It is extremely easy to lay yourself, however, so if you’re experienced in a little DIY, laying fake grass is fairly trouble-free. Most manufacturers have instructions on their website, outlining the equipment you’ll need and best practice processes to get it looking right. So if you’ve ever believed having an artificial lawn was a dream too far, it might actually be far more achievable than you first thought.